Already 13 seasons into his major league career, Rheal Cormier re-signed with the Phillies for 2005. The contract covered two years and the team had an option for 2007, The Allentown Morning Call wrote. "One of my goals is to pitch when I'm 40," Cormier told The Morning Call ahead of his 38th birthday. "I knew it wouldn't be easy. I keep myself in good shape. I'm the oldest guy on the team. I don't feel 38, I feel 30, and I have to keep that attitude. It's all about performance. If you perform, everyone is happy." Cormier ended up pitching in the majors into 2007, though the final game of his 16-season career came just shy of his 40th. Cormier did, however, continue pitching. In 2008, he represented his native Canada for the second time in the Olympics - 20 years after his first appearance there. Cormier's career began in 1988, taken by the Cardinals in the sixth round of the draft out of Community College of Rhode Island. Cormier grew up literally in a shack in New Brunswick, Canada, The Morning call wrote in 2001. He avoided hockey over the equipment costs. Instead, he got a baseball glove. Before signing with the Cardinals, though, Cormier went to Seoul. Canada went 1-2 over the games. Cormier hit the field with the Cardinals in 1989 at single-A St. Petersburg. He went 12-7, with a 2.23 ERA. 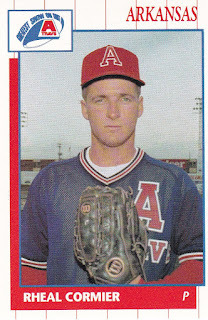 He then made AA Arkansas in 1990 and saw four starts at AAA Louisville that year. He returned to Louisville to start 1991, then made his debut in St. Louis that August. Cormier started 10 games for St. Louis down the stretch. He went 4-5, with a 4.12 ERA. He gave up six hits over 5.2 innings to pick up his second win of the year. He left that game after getting hit by a come-backer. He earned regular status for 1992, going 10-10, with a 3.68 ERA over 30 starts for the Cardinals. Cormier moved to the Red Sox for 1995, then Expos for 1996. Shoulder issues limited his time in 1997 and 1998. He then returned to form with the Red Sox in 1999 and he turned reliever. Cormier saw 60 relief outings with Boston in 1999 and 64 in 2000. He arrived with the Phillies in 2001 and stayed there into 2006. Along the way, he didn't pitch in fewer than 54 games in a season. In 2004, he saw 84 appearances and turned in a 3.56 ERA. "Rheal is very vital to us," Phillies manager Larry Bowa told The Morning Call in 2001. "Big time. ... He has really been a bridge to the closer. What makes him extra valuable is he can work several innings because he gets right-handed batters out better than the lefties." Cormier moved to the Reds mid-2006 and played his final six games with Cincinnati in 2007. In all, he saw 693 major league contests over 16 seasons, with a career ERA of 4.03. He then worked to prepare for the 2008 Olympics, rehabbing an injured shoulder in the process. By the time the Olympics came, Cormier even seemed to leave the door open for more, while being happy with what he'd achieved, according to The Toronto Star. "Whatever (comes) after this is fine, and if it's the end of the road, that's great," Cormier told The Star. "I can't complain. I've had a great run, and at the same time, if there's more beyond this ..."
In 2009, he was back in New Brunswick, working with local children in a baseball clinic. "To have the kids come out and do the baseball clinics and try to influence some of the kids that are in the community [was a thrill]," Cormier told CBC Sports. "If you have a dream, you just have to keep at it and do the best that you can."